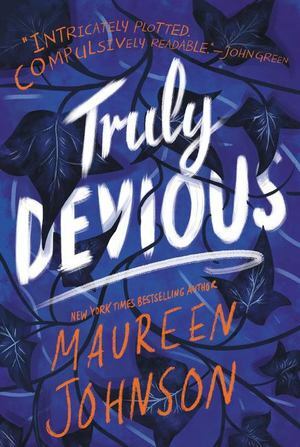 *Publishers Weekly Best Books of 2018* New York Times bestselling author Maureen Johnson weaves a delicate tale of murder and mystery in the first book of a striking new series, perfect for fans of Agatha Christie and E. Lockhart. Ellingham Academy is a famous private school in Vermont for the brightest thinkers, inventors, and artists. It was founded by Albert Ellingham, an early twentieth century tycoon, who wanted to make a wonderful place full of riddles, twisting pathways, and gardens. "A place," he said, "where learning is a game." Shortly after the school opened, his wife and daughter were kidnapped. The only real clue was a mocking riddle listing methods of murder, signed with the frightening pseudonym "Truly, Devious." It became one of the great unsolved crimes of American history. True-crime aficionado Stevie Bell is set to begin her first year at Ellingham Academy, and she has an ambitious plan: She will solve this cold case. That is, she will solve the case when she gets a grip on her demanding new school life and her housemates: the inventor, the novelist, the actor, the artist, and the jokester. But something strange is happening. Truly Devious makes a surprise return, and death revisits Ellingham Academy. The past has crawled out of its grave. Someone has gotten away with murder. The two interwoven mysteries of this first book in the Truly Devious series dovetail brilliantly, and Stevie Bell will continue her relentless quest for the murderers in books two and three. What?! No resolution about who is the suspect both the past and present? I still feel like its not just Ellie... i have got some bad feelings about David. Anyway David is son of Senator King which is Stevie's parents Boss.